Alicante, Spain… AGAIN – Day 2 & 3! This morning we headed off around 11:00AM to Playa del Postiguet, the beach that lies right across from our hotel. Liz has been feigning for some sun and I just wanted to jump around in the clear blue water. The views from the beach are pretty incredible as you can see in the second photo below. If you’re wondering what that mountain looking thing is in the background, that is Santa Barbara Castle (Castillo de Santa Barbara). If you’ve seen my photo album of Alicante, Spain you’ll notice that I took some pretty amazing photos from the top of that castle during my last visit to Alicante. After spending a couple of hours at the beach we decided that we’d go grab some lunch at Foster’s, the same restaurant that we dined at last night. Normally neither of us like to dine at the same restaurant more than once or twice, but to be honest it’s extremely hard to find good quality food here in Alicante. There are many restaurants along the esplanade but nothing to write home about. After another great meal at Foster’s we headed back for a siesta. You know, Liz and I try to blend in with the locals here and take part in the traditions. You know the saying When In Rome, do as the Romans do. Well, the same thing applies here in Spain. Or maybe I’m making all of this up and we could really care less about the traditions and we’re just so lazy that we want to take naps every afternoon. Either way we enjoyed our little siesta. Once I woke up I headed down to the lobby to get some work done on my website as Liz slept a bit longer. Once she was ready we headed off to walk along the esplanade and took a stroll through the markets. Once we built up an appetite we stopped into a restaurant called Penelope which is located across from the port on the end of the esplanade. We had a fairly good meal and a few good drinks as well. After dinner we headed to bed fairly early because we planned on heading to San Juan beach in the AM. Well, what do you know? We slept in again this morning. We’re totally in lazy vacation mode. After going back and forth on what we should do whether it be head to the beach, or head up to the top of Santa Barbara Castle, I decided that we’ll go to the castle this morning to get that over with then we’ll head to the beach because once again, Liz NEEDS sun! There are two ways to reach the top of the castle. You can jump on a bus for 2 Euro that comes hourly or you can walk. The walk really isn’t too bad, but we waited for a bus. The bus ended up not showing up so we decided that we’d attempt the walk. Liz was feeling weak and tired and when we got about half way she decided that we probably shouldn’t attempt the climb because she might pass out. 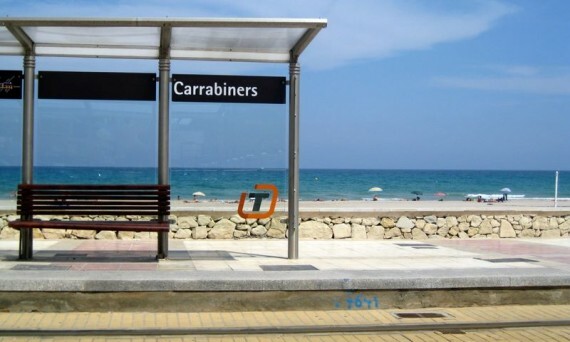 Luckily we were right next to the TRAM station which was the connection to San Juan Beach. As soon as I mentioned that we had the option to jump on the TRAM to San Juan Beach her eyes lit up like a christmas tree. Hmm, weird? Myself and the tan-aholic jumped on the train and took the 15 minute ride down to a beach that I visited the last time that I was in Alicante. This is by far the best beach that I’ve been to, and I knew Liz would love it! We stopped to grab some lunch first at a beach side restaurant called La Ponderosa. 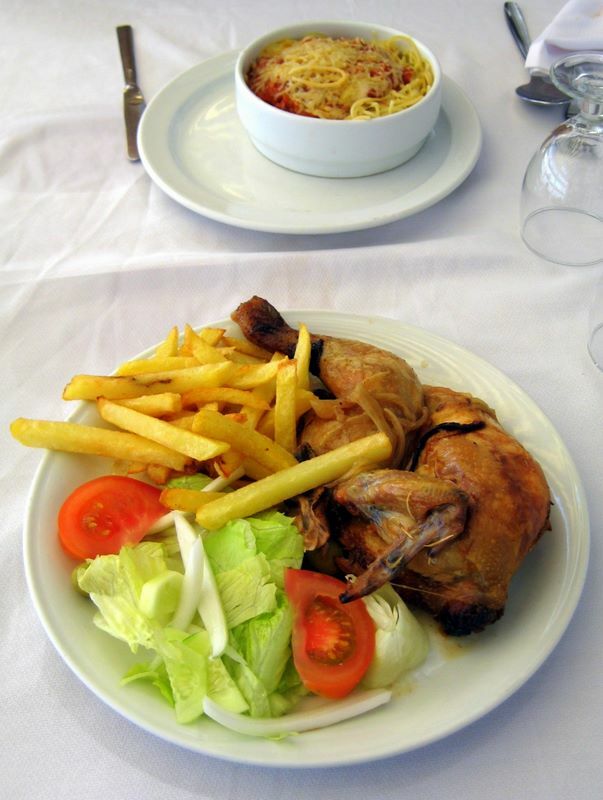 Liz had Spaghetti Bolognese and I had a 1/2 Roasted Chicken with Chips, yummy. Once we finished lunch we got ourselves a front row seat on the edge of the ocean. We rented two chairs and an umbrella for 9 Euro, which was sort of pricey but if anything the umbrella was most necessary because I can only lie in the sun for so long. Liz on the other hand… well, let’s just say that she left with a burn! 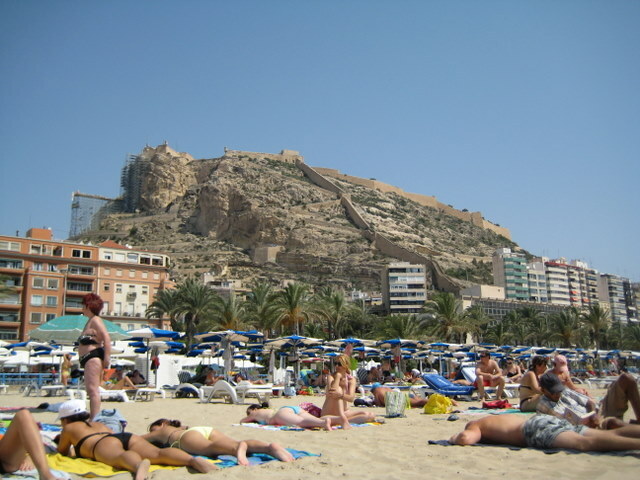 We spent a few hours at San Juan Beach and we headed back to Alicante around 4:15PM. Once we got back to the hotel we showered and got ready to meet up with my friend Gosia who I had met during my last visit to Alicante. We met with Gosia and her two friends around 8PM at Desden where we had a drink before heading over to an Irish Pub called O’Hara’s which is located on the esplanade. While there we had a few sangria’s and some food. Before heading home for the night we grabbed a gigantic ice cream sundae from this gelateria called Explanade. We took it back to the hotel and absolutely devoured it in the lobby while I did some work on the site. What an end to a great day! Now I’m relaxed, and comfortable and Liz is a lobster! 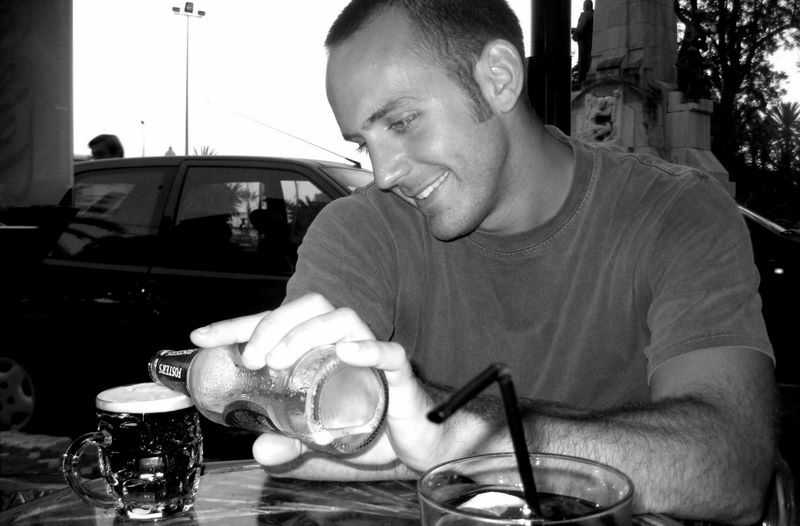 Remember what they say… the sun is stronger in Spain! OK LIZ- ENOUGH OF THE SUN! It sounds like you guys are having a fabulous time. Ryan, you’re a great writer and should but all of this in a book! 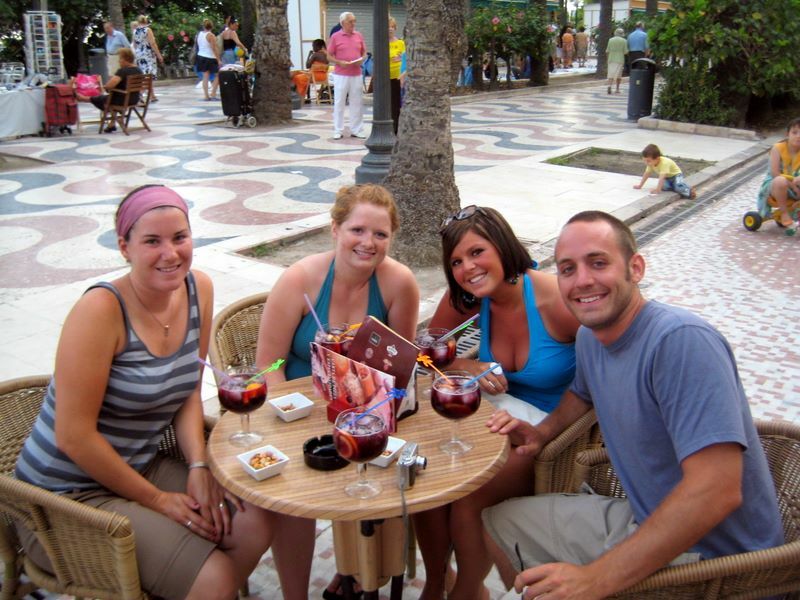 Just looking at the fabulous pictures we all want to take a trip to Spain and Croatia! See you soon Liz! Ryan, enjoy the rest of your trip.